Thankfully, we the geographically displaced are able to get a sense of this “imaginative breadth” and partake in the shows unbridled optimism through the exhibition's website, which is refreshingly easy to use. Militant anti-flash website that we are, we were nevertheless disarmed by its multi-navigational interface. For over a week now, we've been madly clicking away like trigger-happy Blackwater soldiers. And we don't see ourselves stopping anytime soon, as there is this link archive provided by MoMA. In any case, while combing through the website, we were happily reacquainted with some of the projects we have covered before and some that are conceptually similar to ones we have written about in the past. There are about a dozen of them. We are going to archive them in two separate posts. One of the unexpected outcomes from our recent self-linking bacchanalias is that they highlight one of this blog's overriding themes — how natural processes, like hydrology, growth and decay, become entangled with human culture. Corollary to that is the role technology — old, new, and imagined future ones — plays in this entanglement, a role which can often lead to and indeed does result in dramatic landscape changes. This is another theme that appears again and again on Pruned. And it also underpins all the disparate choices for this MoMA exhibition, which, as the online catalogue explains, “explores the reciprocal relationship between science and design in the contemporary world by bringing together design objects and concepts that marry the most advanced scientific research with attentive consideration of human limitations, habits, and aspirations.” With these upcoming self-linking bacchanalias, then, we should have another chance to at least vocalize another longstanding interest. We'll be your docent, absolutely free of charge. 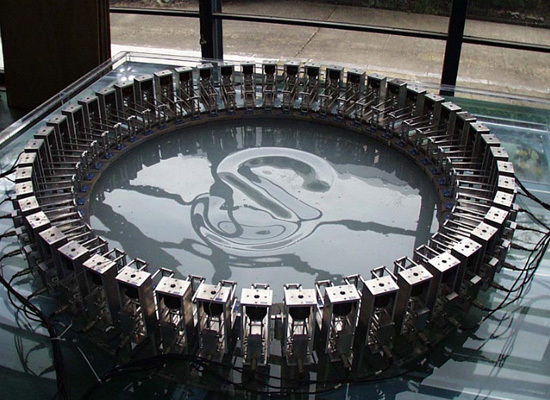 Using the fifty plungerlike mechanical units installed along its rim, AMOEBA can produce a variety of wave conditions and then calm the water's surface on command. One of [Shigeru Naito]'s students found another use for this equipment: creating the alphabet on the water's surface. When waves in various frequencies converge, the water's surface rises at specific points; by connecting these points, lines and shapes can be drawn. Of course, we also found another use for it, specifically to inscribe the Gardens of Versailles in their entirety and in full scale somewhere in the South Pacific. Hydrology coalescing into elaborate parterres, Baroque statues, and architectonic hedges and borders — all of which doubling as aquariums. A pack of humpback whales, for instance, will be gliding gently alongside as you sail down the main axis, their timeless chanting filling the breezy tropical air. Enter any one of the many bosquets dotting the landscape and you're soon surrounded by a swarm of fish. Enter another one and you're soon privy to the mating rituals of giant jellyfishes, seemingly weightless. Ethereal. Watch out for the one with the great white sharks though. Then at night, you set anchor in the middle of a tapis vert, a simple grass lawn on land perhaps but out in the Pacific, it's a vast cultivated field of bioluminescent dinoflagelletes. We also found how this Baroque fountain can play a role in maritime warfare. 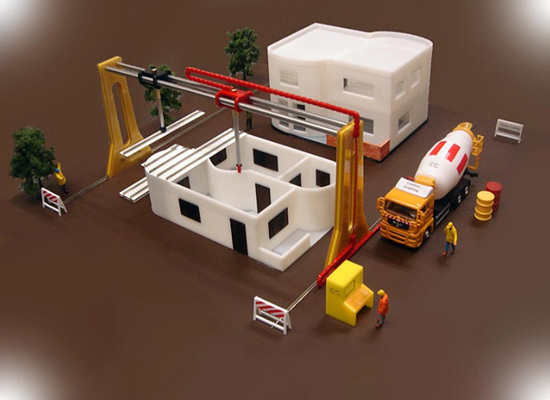 A single house or a colony of houses may be constructed automatically by the process in a single run, with all plumbing and electrical utilities imbedded in each house; yet each building could have a different architectural design. An average size custom-designed house may be built by Contour Crafting within a day. The implication is especially profound for emergency-shelter construction and low-income housing. This new mode of construction will be one of the very feasible approaches for building on the moon or Mars, both of which are being targeted for human colonization before the end of the century. We, on the other hand, thought that it could also be turned into a cenotaph mega-machine, capable of printing thousands of Pharaonic mausoleums based on designs by Boullée, resulting in entire provinces or states or even whole nations becoming literally valleys of the dead, hosting thousands of encapsulated monumental voids. 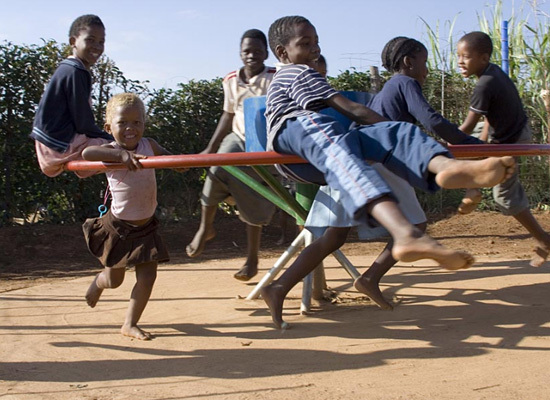 The PlayPump water system is a merry-go-round that uses kid power to pump water. As they play, children spin the PlayPump, powering it to the pump underground water into an aboveground tank. This 660-gallon storage tank provides easy access to water with the simple turn of a tap. The storage tank also serves as a billboard, which can be used to promote messages about social issues relevant to a particular community. By some accounts, these hydrological playgrounds are quite successful in augmenting infrastructural deficiencies in several African countries, but we did wonder last year if there was a better strategy in giving African children better access to fresh water while also greatly benefiting American kids. Wouldn't it be better to just slice off a sizable chunk of what we in the United States spend on public water services — for instance, to recreate some sort of Edenic fantasies in the desert Southwest with water diverted from severely depleted sources — and give this piece to sub-Saharan African nations where the money will be used to improve their hydrological infrastructure, and we are the ones who get to install the PlayPumps in our school grounds and playgrounds, wherein a growing population of obese, diabetic, allergic children, the ones inured to the hardship of suburban domesticity, are forced to trim a little bit of the fat, reduce their susceptibility to diabetes and prevent future addictions to Allegra® and Claritin® and simultaneously teaching them about the incredibly, wonderfully awesome subject of hydrology and imparting a life long commitment to water conservation? Grouped with the PlayPump and other methods of “local energy harvesting” are the Non-Stop Shoes by Emili Padrós, of emiliana design studio. With Non-Stop shoes, Padrós looks at the energy potential of everyday routines such as walking, climbing, stairs, and opening doors. Energy generated during the day by these activities is stored in the shoes and may be used later to power devices such as a lamp, a radio, or a fan. Containers could be used to collect energy from the shoes of a whole family to feed more power domestic appliances. This is one of the projects that we did not cover before, but it is astonishingly similar in concept to Alberto Villarreal's BrightWalk, the winner in last year's Metropolis Magazine Next Generation Design Competition. 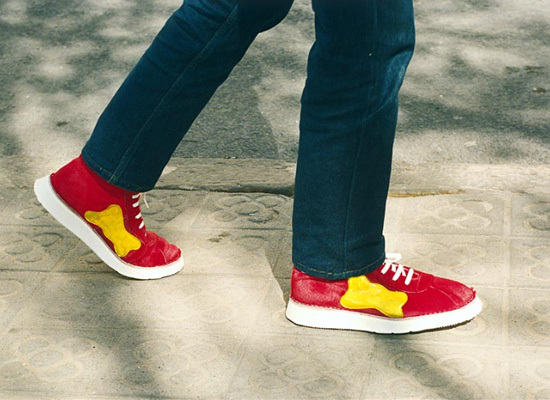 Villarreal's shoes were mentioned in a post with other projects experimenting with piezoelectric membranes as an infrastructural with which renewable energy can be harnessed. These other projects include a Japanese train station whose ticketing gates are embedded with piezo pads and Elizabeth Redmond's PowerLeap, both of which also investigate the potential of piezoelectricity and, in the case of these two, how can be spatialized on an urban scale. Weaving through the urban landscape along with our already dense infrastructure of consumption will be an equally dense filigree of an infrastructure of production. Again, we never wrote about this, but there was one similar project that we did. 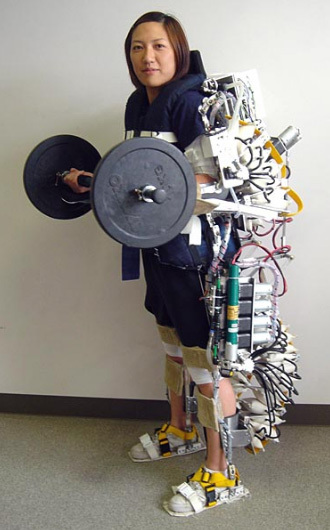 It's called the Bleex, or Berkeley Lower Extremity Exoskeleton, and this DARPA-funded exoskeleton allows the wearer to carry hundreds of pounds (potentially more) with little physical effort. In other words, using the Bleex, you can carry as many as a dozen bedridden patients, if you wanted to. It's the future of guerrilla gardening. You get suited up with the Bleex, and with your night vision goggles, satellite navigation systems and weaponized hoe, you set about re-wilding urban concrete wastelands. Under the cover of darkness, a squadron of Bleex Soldier-Gardeners carries out sabotage on Wal-Mart parking lots. With prairie grasses and wildflowers. The Bleex, unfortunately, may be too expensive for the local garden enthusiast, in which case there is the Muscle Suit. 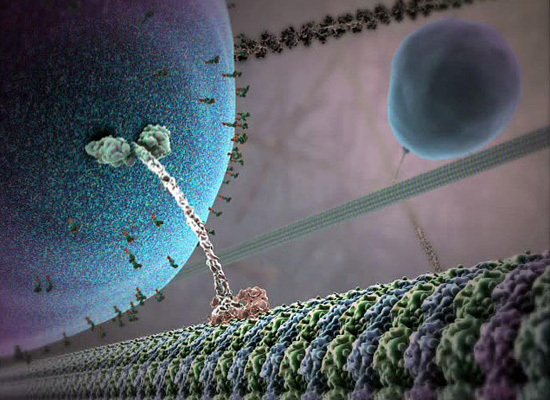 And finally for today is the image above from one of The Inner Life of the Cell animations, conceived by professors at Harvard University and animated by XVIVO. This animation and others in the series are used as a teaching tool for undergraduate students. It was quite extraordinary seeing it then, and it still is. The video used by MoMA for its website is a bit tiny, but a larger version — with a soundtrack — can be viewed here. Thanks, Tom - come back any time. I think their website is really hard to follow...thanks for breaking down some of the key projects!